How to watch Star Wars: Episode IV: A New Hope (1977) on Netflix Argentina! 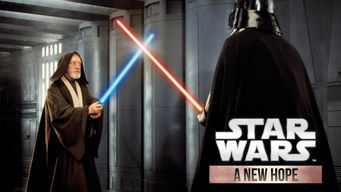 Yes, Star Wars: Episode IV: A New Hope is now available on Argentine Netflix. It arrived for online streaming on October 7, 2017. We'll keep checking Netflix Argentina for Star Wars: Episode IV: A New Hope, and this page will be updated with any changes. Obi-Wan Kenobi guides intrepid Luke Skywalker on a valiant bid to save Princess Leia from Darth Vader in a classic battle between good and evil. The battle between light and dark requires a lot of space. Want adventure? These are the droids you're looking for.